With 1.28 billion monthly active users, Facebook has become the central hub for social exchange today. Second only to Google as the most visited site, Facebook has effectively weaved its platform into day-to-day life and culture one friend request at a time. But with Facebook housing the largest database of online profiles and personal information on the planet, the network promises more possibilities than mere social exchange. 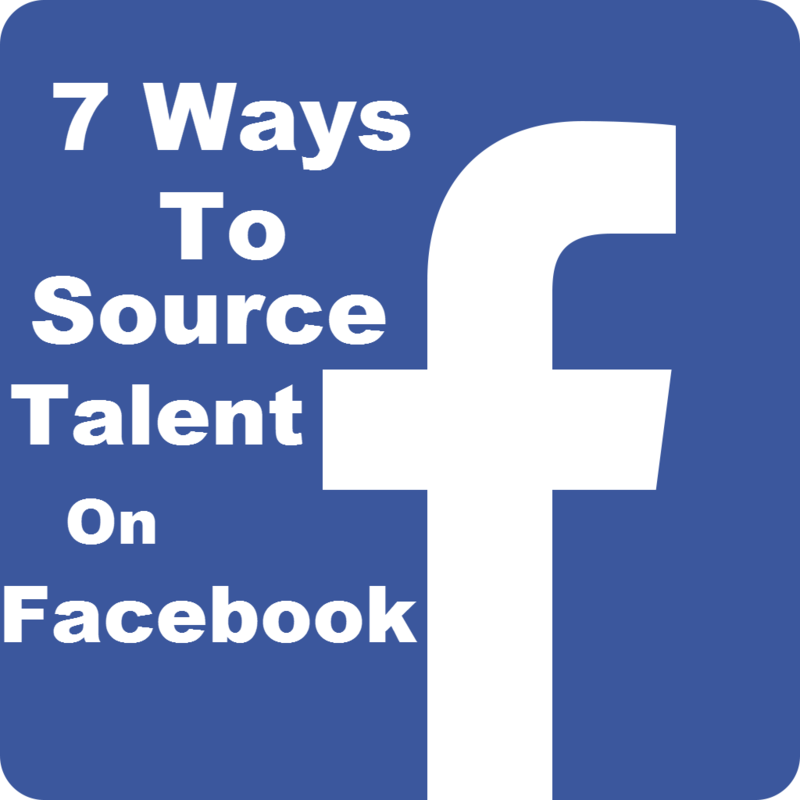 For employers, recruiters, and talent acquisition professionals, Facebook presents potentially the most powerful online directory of talent on the planet. Carrying over one-seventh of the global population’s personal data, don’t you wish there was a tool that could help you search for pools of qualified candidates fitting an exact criteria? Hello, Graph Search a.k.a. Facebook’s gift to recruiters. Released just last year, Graph Search lets you find people inside and outside your network of Friends based on their personal profile and activity. 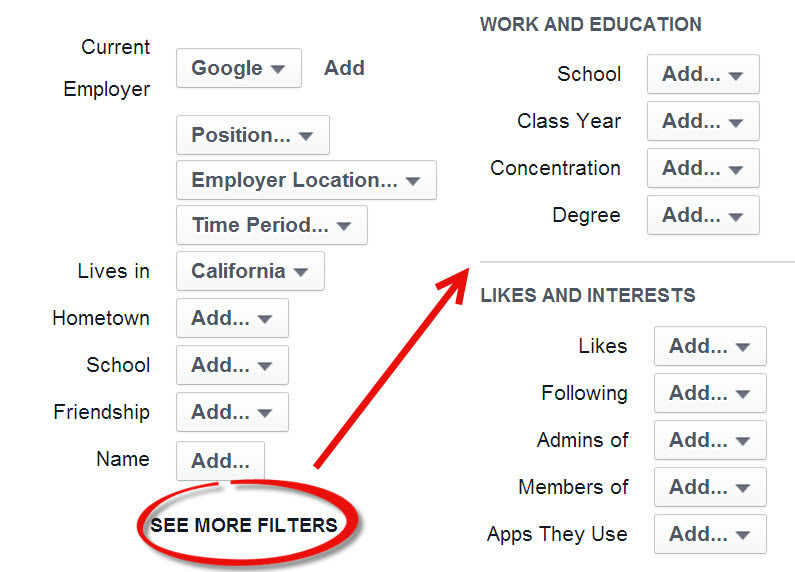 The tool covers basic search fields like location, current employer, work and education, but can also include more advanced filters such as searching based on liked pages, groups joined, and even places checked-in. But the tool is only as effective as the strategy that supports its use. Here are a few tips to guide your first steps in searching and sourcing candidates on Facebook. The Graph Search algorithm ranks search results in priority to your closest contacts first. This prioritization really works to the recruiter’s advantage as it helps map the reach of your existing and extended networks, showing you if a candidate is just one Friend degree away. Recruiters must then rely on sound judgment on whether to send a direct friend request, reach out to the closest mutual friend for an introduction, or transfer to a separate network, like LinkedIn, to make that first, professional touch. Test and determine the best approach and soon enough you will witness your network grow with purpose. You may start to notice either the same popular Friend at the top of those search results or the same Mutual Friend attached to the candidates you want to connect with. This is likely a sign that the popular individual is an influencer in the very network you want to access, and can act as a key ally to expanding your network and content reach on Facebook. But influencers’ attention and trust must be earned. Luckily Facebook gives you many options to warm a cooled contact. The first touch could be as simple as liking a post, sending a direct message, or learning if a birthday or anniversary is on the horizon for a well-timed, personal greeting. If you’re looking for candidates via Graph Search, you can bet they are looking for you too, so design a company and personal page that is optimized for search and will encourage that Like from your visitors. 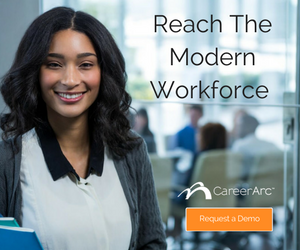 One way CareerArc helps company pages increase Likes and repeat visits is through our branded careers tab we call CareerArc for Pages which lists a company’s latest job openings and link directly to the job posting on your career site. 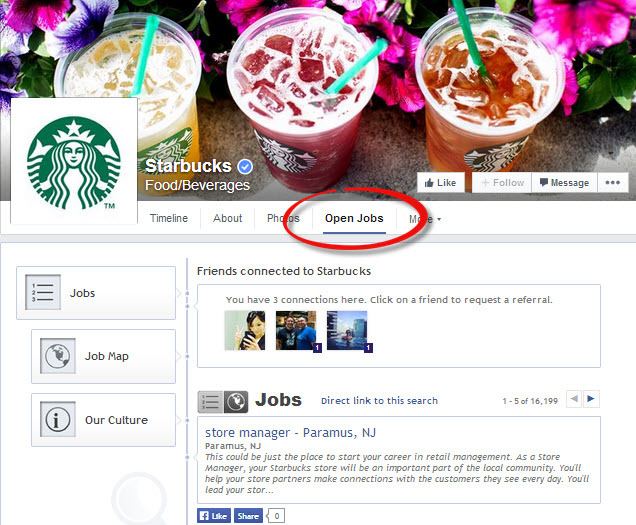 Below is an example of the CareerArc for Pages careers tab we power for our client, Starbucks. Each job listing can be instantly shared across platforms. We believe so much in the strength of Facebook’s referral network that we created a Facebook app called the Who? Button that leverages job seekers’ existing networks for their job hunt, effectively turning their social network into a potential source for job references. With Facebook making significant changes to its algorithm earlier this year, original content creation has become more vital than ever when competing for attention. Testing and determining which content your audience prefers and expects from your brand is paramount. Our client Ericsson serves the type of content it sees growth in demand from its followers: results from original studies and surveys. 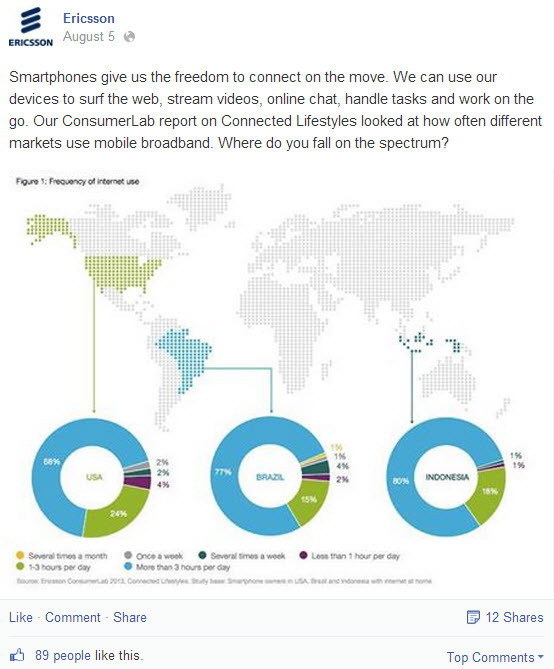 Above is Ericsson’s recent popular post about global smartphone usage. They engage their audience to consider the survey findings through one simple question: Where do you fall on the spectrum? Ericsson also has a CareerArc for Pages career tab for candidates who, after reading Ericsson’s timeline posts, are then moved to seek out open opportunities. Be it online or offline, building and nurturing the network takes time. Graph Searching can make online networking seem deceptively easy, quickly pulling a directory of people in just a few clicks to whom you can then fire messages as fast as you can type. However, refrain from making any direct requests from your network especially if you’ve just joined or reconnected. Instead first ask how you can serve that network: share content that speaks to your interest to communicate your brand and occasionally send influencers content that speaks to their interest in personalized direct messages. Since Facebook has made it really easy to silence updates from individuals, you want to make sure your messages give more than they take. With all its power, Graph Search itself cannot substitute for the recruiting and sourcing know-how that will drive the strategy behind how you search and what you do with the information you find. Some advanced Graph Search filters that specify age, religion, political views, for example, will not really benefit your work. When messaging a new contact, refrain from mentioning the photo you saw of him and his family at the Grand Canyon from a trip he took two years ago which was just breathtaking. Yes it’s a compliment, but it gives the impression that you just spent the past hour combing through his photo albums—another activity we advise against. We think the Golden Rule best applies here. Put yourself in your candidate’s shoes and picture the ideal candidate experience from start to finish. Now follow your lead.